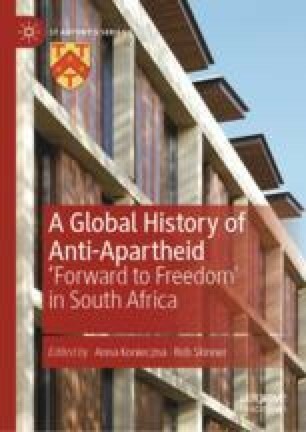 This chapter examines two concepts that played a significant role in shaping an ideological framework for anti-apartheid that fostered global solidarity with the aims and agendas of South African liberation movements. International solidarity against apartheid relied on the effective reconciliation of global and local issues; on the capacity of activists to imagine themselves as part of a global endeavour that was at the same time connected to local concerns and everyday experiences. This chapter argues that humanitarian ideals helped to shape a set of shared assumptions regarding racial equality and framed global responses to the development of apartheid around perceptions of ‘victimhood’ ‘crisis’ and universal needs. At the same time, global anti-apartheid was consolidated within supra-national organisations such as the UN and became a focus of the nascent discourse of human rights. Ultimately, though, global anti-apartheid was constructed in the minds of individual activists; concepts of humanitarian need and human rights were significant insofar as they prompted activists to imagine the ways in which they were implicated in the injustice of apartheid.